Sometimes in the middle of the night you get up with a great idea. Not sure how to implement it, but a concept you want to experiment and have fun with. Well I just did that! The Nikon Fisheye 10.5mm 1:2.8 lens has given me some extraordinary results this year. I wanted to do a composite where the kids could give me some really silly expressions. The DMHA Dundas Blues team was just up for that challenge. Even the coaches got in on the action...Although I had to hunt a few down [TeeHeeHee], they were great sports. Movember is a very good time to get that real grunge look too. I really didn't know how I was going to pull it together. The shoot was really fast...like an assembly line. I used my favorite Westcott Ice Light, reflector and remote flash. 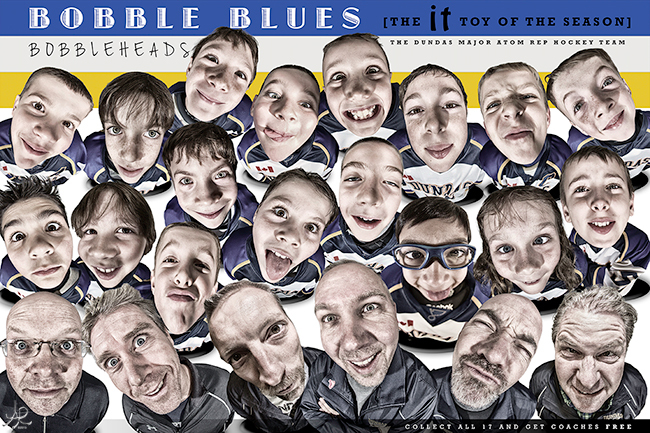 The images were all extracted on the Wacom Cintiq tablet and various filters were used in photoshop to finish the The Dundas Blues Bobblehead Composite. I still enjoy the traditional team photo...I just like to add a little more character to make it different. Thanks Al & Jeff! "Zamboni" The Coldwater Community Centre in Orillia was beaming with character! Something you don't know! When my little guy first started playing hockey he wouldn't get out of bed, he would sit on the ice, he would not listen and misbehave. Yes we still got up at 5am for the 6'O'clock practices. We stuck with it and it was our son's decision to try out for rep. We were skeptical and he was not ready. He didn't make the team that year, but had an AMAZING season playing select hockey. The next year came and he wanted to try out again. More prepared and focused-YAY he made the team. He never gave up and loves to play hockey. In his first year playing I took some snaps of him on the ice. I didn't know the people helping him would be his coaches today! Back then you were just a guy on the ice. Your photo hung in my son's room for years. Proud to call you coach today. Thanks Denis! This entry was posted in Articles, Design, Marketing, Photography and tagged Aerial Promotions, Arena, Arenas, Bobblehead, Coldwater Community Centre, DMHA, Dundas, Dundas Blues, Dundas Major Atom Rep Hockey, Hamilton Hockey, Hockey, hockey arena, Orillia, Photographer, photography, Robin Leworthy Wilson, Robin Wilson, sports photography, Team Photo. Bookmark the permalink.